A couple of weeks ago I received an interesting message from the from the Center for Book Arts in New York City. 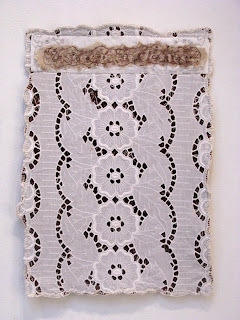 I've been invited to submit work for consideration for an upcoming exhibition tentatively titled: Threads: Interweaving Textu[r]al Meaning. 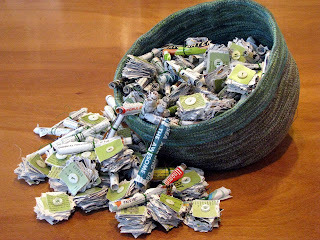 I was contacted because of my piece in the Lark publication 500 Handmade Books! I was so honored to be noticed that of course I said I had other, similiar works......but, until a few days ago, these pieces only existed in my mind! Thus, I've taken a little break from other work and created the first of two pieces made from World Book Yearbooks, 1962-75. Steve and I acquired these volumes at a book auction. They were part of a very large "table lot." We weren't interested them but had to take them away...it's all or nothing! For a couple years we tried to sell them, donate them, or convince our recycling center to take them. No one wanted them. They ended up in my studio....wasted words. To be honest, I love them. Flipping through the pages is a journey into my childhood. Browsing through the articles brings back all sorts of environmental concerns....saving whales, the dangers of pesticides, electric cars, dwindling natural resources, over-population issues, gas masks, and the overwhelming need for adults to take immediate action. In elementary school, I felt completely reassured that the global warnings I was learning in social studies class would be addressed and solved before the year 2000....a popular date on all the pretty pie charts and graphs. Never good in mathematics, it took me days to calculate that I'd be forty years old on January 1, 2000, the first day of the new millenium....turning the ripe old age of forty-one later in June. I couldn't even imagine being forty. It was such a long, long time off in a distant future that would be filled with mass transportation, new sources of energy, protected animals, clean ways to dispose of garbage and international recycling programs. I seemed to have blinked my eyes and now I'm turning fifty! The world isn't better off. The same environmental issues exist....and now I'm the adult! Of course I've tried to "do my part". We actively recycle. I drive a moped and our car isn't a big gas guzzler. Is this enough? Probably not. Maybe this artwork, however, will help bring awareness to others. I removed all the articles about conservation, ecology, and other issues from all the volumes of World Book Yearbooks, 1962-75. These articles were carefully ripped and rolled so that highlighted words are visible. One volume, 1969, was selected randomly, ripped into strips and stitched into cubes with recycled buttons. 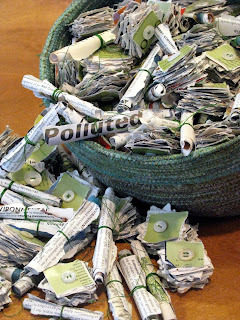 All this was placed in a green fiber vessel made from 100% natural yarns. A little over two weeks ago I ran into Dana Blau Shenker at a charity art event. Dana owns one of my "In Box" series pieces. Her mother owns several works and has honored me with two commissions for the conference room at DP Professionals. Dana asked about my current project and a discussion about the Decision Portrait Series ensued. As a talented, figurative painter who understands the need for models, Dana immediately volunteered to pose for a portrait....but I'm looking for models willing to share significant life decisions. I asked, "Are you willing to share you most important decision?" Without hesitation, Dana said, "Yes!" "What is it?," I questioned. "I had to agree to have children before Hilik would marry me." I was flabbergasted! Was Dana, a strong, independent woman with a college education and a job outside her home, really serious? The feminist in me flared with internal rage. Yet, Dana was already talking, explaining, and TOTALLY RIGHT! Dana didn't want children; Hilik did; a decision had to be made if they were to get married! There's no compromise on children....no trial period, no guarantee, no backing out, no in between area! Hilik wasn't trying to force Dana to do anything. This was a relationship working itself out before establishing a permanent bond of commitment. This was an important decision that had to be made...and wisely done before marrying! I had to think about the terms of marriage. Hadn't Steve and I talked about this issue and other important matters? Of course we had! There's all sorts of decision couples considering marriage face, from wedding plans to living arrangements, from financial obligations to religious affliations, from family traditions to social expectations. Successful marriages are made by joint decisions. 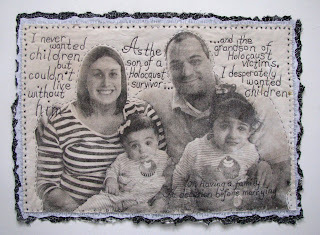 In this case, Dana decided to share Hilik's dream of a family. She has no regrets. Instead, Dana thinks her choice was one of the best she's ever made and is considering more kids! I am proud to know Dana and honored to share this story. Several pieces have mysteriously come to an end within days of one another. 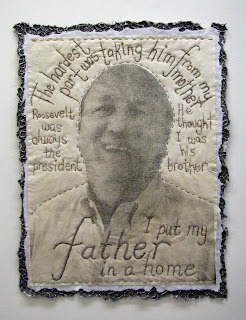 This Grave Rubbing Series piece was finished yesterday. I'm totally in love with the repetitive and soothing motion of the kantha stitch....running stitches that meld layers into one. This piece has triggered many thoughts about the words selected for graves. Obviously, these words speak of the raw emotions of a distraught family. I can't, however, think the man would have really wanted to be remembered quite for this one event! There must have been more to him than his death! As a result, I've been collecting epitaphs...scribbled in my notebook...stewing in my brain for future work. 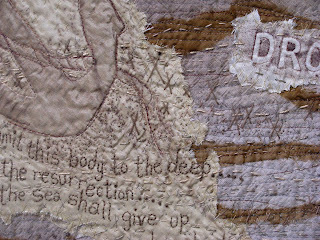 I've also started a very, very large grave rubbing quilt. I'll have to post images while it progresses as I can't possibly finish it anytime soon! 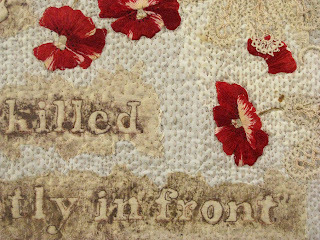 The poppies are a perfect touch. As a Girl Scout, I remember selling artificial poppies on Veteran's Day to benefit the VA hospital. To learn more about the Poppy Story, click here. During the past two months I have been investigating the needs to mount CYBER FYBER 2. I've learned so much, collected valuable information, and made many new contacts. I've also had to face facts. It pains me to announce that CYBER FYBER 2 has been postponed indefinitely....maybe until 2011...maybe longer. Current economic realities are harsh. A bright future might be on the horizon but there's no way to determine when it will blossom. South Carolina ranks second in US unemployment statistics and daily the numbers increase. I know teachers whose contracts will not be renewed after decades of loyal service. I know too many people in the arts and elsewhere being forced to take numerous, unpaid vacation days in order to avoid layoffs. I've had former Mouse House employees call asking if I have any openings. (I don't.) One of the people on my "Selected Reference List" is now looking for a job....needing references of her own. Our newspaper has cut staff because company advertising is so low. This cutback eliminated the entire arts section...writers and editors. The owner/editor of the region's monthly art magazine just took out a second mortgage on his house. 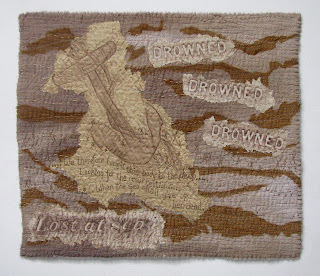 The gallery in which my 2007 show with Janet Kozachek was held has closed its doors. I know of at least one other art gallery doing the same. How can I, in good faith, approach businesses for financial support? I can't! How can I apply for grants from arts agencies that are experiencing as much as 25% reductions from their sources? I can't! How can I proceed knowing that Steve and I can't personally cover the expenses or expect help? It's impossible. I don't, however, have to remove the show's listing from the Gallery 80808/Vista Studio's website. These two weeks in the incredible gallery space are mine! I WILL USE THEM to mount my own solo exhibition. The "working title" is "Life Everlasting". 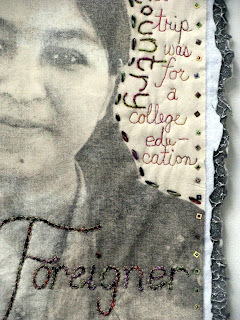 This installation will focus on personal and universal identities through art inspired by grave markers and epitaths. There will be more developments, of course. For one thing, I've recently submitted exhibition proposals for "Personal Grounds" (including the entire Decision Portrait Series) and Blues Chapel. Also, I've applied for several artists residency programs and also for a summer scholarship to Penland. Depending on the outcome of one of these programs, I will hopefully be traveling to Austria with Pian and Annica (my Swedish stitching buddies) to take a workshop with Sara Lechner! I've started submitting my work for gallery representation too. In a nutshell, I'm redirecting my focus...away from CYBER FYBER 2 but toward an exciting, artistic year in art. Generally I send an image of a completed piece from my Decision Portrait Series to the person who posed with a "rough draft" of the blog entry I intend to post. I wait to hear a reply....if that person's name is going to be included. So...sometimes a piece is finished for several days before I post. Today I've posted the last two finished....done last week and over the weekend. Scroll down to see them. I also finished an artist book for my mother. The cover once wrapped around a copy of Washington Irving's Alhambra. 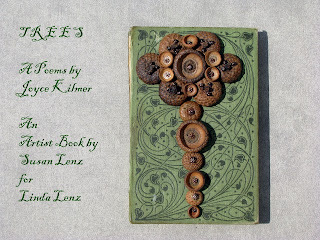 The pages are tea-stained, collaged, and wiped with green dye. The binding is open spine. The letters for the poem, Trees by Joyce Kilmer, were cut from late 19th c. and early 20th c. magazine advertisements. I created a video...complete with music by Paul Forrest (real name!) from a CD called Music of the Trees....using the songs for ginkgo and oak. It's only one minute and forty seconds long. It is here. The post includes a story....a memory really....of being a tree in a second grade play. It was dreadful until my mother recited this poem. I hope Mom likes her "commission" that "uses acorn caps"! The Decision Portrait Series has included several pieces with spiritual decisions including Priest, Rabbi, Buddhist, Atheist, and Christian. I'd love to create pieces for other religious viewpoints and included this desire on the Decision Portrait "wish list". I hadn't, however, thought about someone who identifies with the concept of pluralism! This is actually strange because I totally agree! After all, I see all these portraits hanging together, coexisting, being part of a larger exhibition! I am indebted to my friend Cindi Boiter for making this suggestion and to Facebook for aiding the connection. Yet, most of all I am indebted to Hal French/this man for agreeing to pose and sharing a wonderful, insightful conversation with me when I took the photo. I also enjoyed just being in his office. Hanging on the wall was an oil painting by my mentor Stephen Chesley. The image was used on the cover of The University of South Carolina Press's edition of Hal French's book Zen and the Art of Everything.....which has been published elsewhere and has received all sorts of glowing reviews! 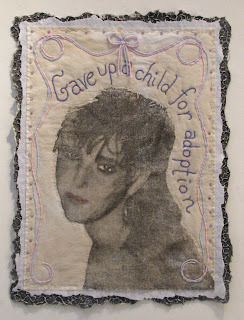 For well over fifteen years I framed photos and child's artwork for at least six or seven different mothers who told me that their child was adopted, a totally wonderful "miracle". Tears leaked out of the corners of their eyes when they brought in one-year old birthday pictures and recounted the "gift" of first holding the baby just the year before. It was always a pleasure....always a miracle. I never really thought about how difficult it must have been for the birth mother....making a "miracle" come true, making a decision like this. The rest of this story: I know the fabulously talented artist who made this decision years ago. I've known her for many of the year since the '80s hair style. She's now the mother of a teenager who just recently got married. She is again a mother of a beautiful infant boy. Even more, she is a Facebook friend with the young man she once gave up! The miracle has come full circle. The word "foreigner" often conjures up dark and scary images, unfamiliar people, unknown places, and strangers. This is generally a misconception! 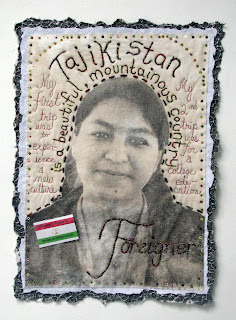 I'm so very, very pleased that this Decision Portrait shows a beautiful, young college student from Tajikistan, a country internationally known for its fine embroidery. It is hard to imagine her decision but she made it. She was willing to leave her family, her country, and her familiar surroundings in order to travel half way around the world to another culture. She's done this twice...willingly becoming a foreigner. She's had to learn another language, other customs, other traditions, and face the misconceptions people have of those from far off places. She's an amazing young college freshman. I am proud to have stitched this story. For the past several years I've been honored to be one of the invited artists at Columbia's Dining With Friends Aids Charity Benefit. Selected artists are given a platter to creatively alter. Each one is sold by silent auction. Over the years many art lovers and supporters have amassed nice collections and the platters are considered quite collectible. In 2007, I was even the featured artist! The theme this year is: Paint the Town Red. So....the pressure was on! I don't paint much....and many of the other artists paint very, very well! Platters aren't easily stitched. I've already attached buttons and one of my "In Box" fiber works....so....this year I embellished! 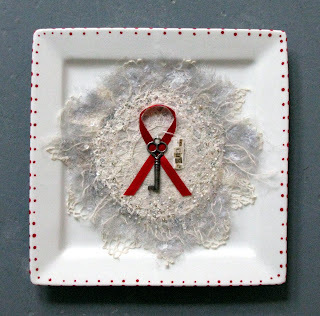 The centerpiece was created from two vintage doilies, wool rovings, silver chiffon, assorted off-white knitting yarns, and white felt. 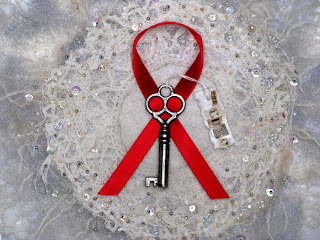 I beaded it by hand, attached the symbolic red lapel ribbon and ornate key, and created the tag: The KEY TO THE CURE. I sure wish someone would find the right key! This is the first piece created on my new embellisher. My mother bought me the twelve needle machine; she got my older seven needle machine. I'm thrilled with both the machine and the platter. Oh...I painted the edge of the platter with Liquidtex's red "Glossies", a product specifically made for painting on glass and porcelain. It requires heat setting in the oven. Steve baked the plate for me! I attached the centerpiece with Golden's GAC 200, the hardest of the polymer emulsions. Although there's a warning about permanent adhesion with glass and porcelain, I've not had any problems....likely due to the fact that there's no wear and tear trying to detach the fabric from the platter! Dining With Friend's is being held on Saturday, April 25th. Spring time here in South Carolina is always busy with charity fund raisers. Just last week I participated in a one-night only art sale benefiting the local homeless shelter. Both of my pieces sold! 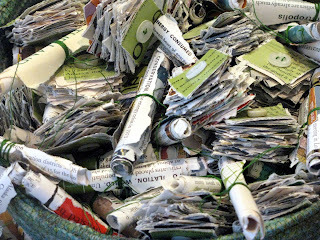 (Both were miniature "In Boxes" created last October during my time at the MacNamara Foundation.) I'll be participating in Spring for Art, a fund raiser benefiting the McKissick Museum, on March 27th. The day before Dining With Friends, I'll be at the 5th Annual art gala benefiting Sandhills School, a private institution for children with learning differences. That's the same weekend as the annual spring gallery crawl, Artista Vista.....busy, busy, busy! On Fighting Cancer I, II, II, IV. On Aging I, II, II, IV, V.
For more information, please just visit the Decision Portrait blog....I'm looking for all these people. I can work long distance with anyone who has Internet access. I'm open to new ideas, modifications on any of the themes, etc.! I'm behind in blogging....but thinking...a lot! There are photos to be cropped, corrected, and titled. There are links to be made. 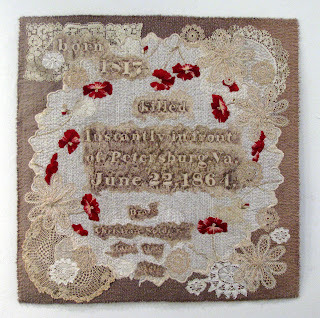 There are so many feelings, ideas, and thoughts to be expressed about the embroideries I recently saw in England. I'm working up a marathon of posting because I really do want to remember the experiences. The inspirations and decisions are impacting me already. So, check back. Maybe even tonight I'll be composing, uploading, and sharing. In the meantime, I'm not behind on my personal work. (Yippee!) Above is the latest piece in my Decision Portrait Series. It is called Dealing with Alzheimer's. I've known Sam Crews for many, many years. We've swapped family stories while attending antique auctions. Sam used to work as a small business lawyer. His professional advise solved a few employee dilemmas and also navigated the paperwork for Mouse House's incorporation. When we met, our children were in diapers and our parents were young and vital. Over the years, our children grew into adults....and Alzheimer's entered the picture. I haven't had to face this situation, but Sam has...with grace, prayers, and a saving sense of humor. I hope people seeing this artwork reflect on their family members, think about their own preparations for the future, and the decisions we all have ahead....We're all getting older! This portrait will be on display at Gallery 80808/Vista Studios for the annual spring gallery crawl called Artista Vista, April 23 - 25th, 2009. 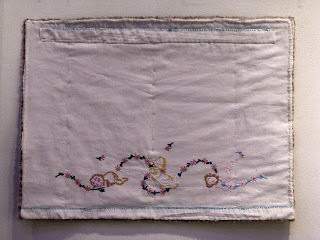 I didn't photograph the reverse of this small art quilt as I didn't use vintage linens. I did, however, use recycled black felt in place of the batting. It came from the local canoe and kayak shop. New boats are sent to such stores wrapped in perfectly usable felt. The owner didn't want to throw it away, so he gave me yards and yards of the stuff! 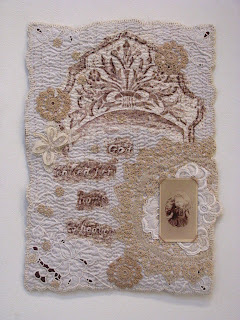 There's something wonderful in using old linens, recycled materials, and grave rubbings together. 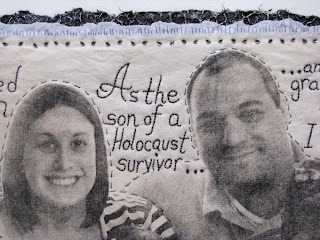 The used fabric just seems to feel better...like it is lending a spirit of the past and making a point of remembrance. It also seemed "right" to incorporate something attached to the notion of a "boat" with the sentiments of loss and mystery surrounding such a death. How others travel without a needle and thread is a concept I just don't understand. I love airplane, train, and car adventures...stitching while moving....drawing a thread through fabric while looking out a window. 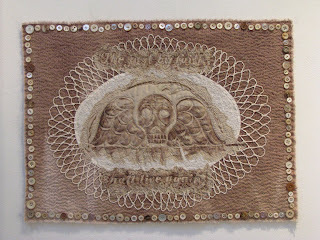 I took these two small grave rubbing art quilts with me to England and nearly finished both during the trip. 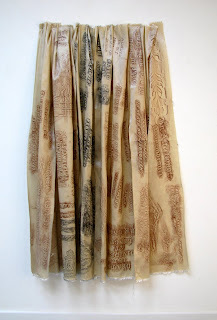 Kantha stitching has truly inspired this series. 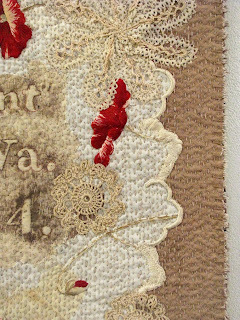 I adore the notion of quilting together recycled materials, combining fabric and a sense of the past into something relevant. Okay....I've likely gone a bit overboard with the kantha stitch. Mine are small and close together....totally covering the entire area. I feel compelled to mark every square quarter of an inch with stitch! Yesterday I completed the reverse sides and photographed them. 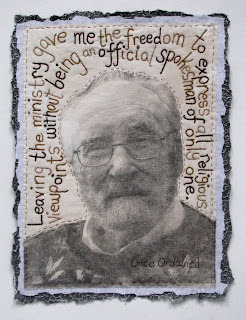 I'm already at work on two other, larger grave rubbing quilts and stitching a new piece in my Decision Portrait Series, Dealing with Alzheimer's. 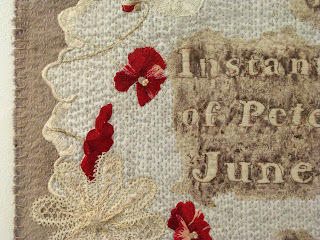 I know I've promised a post on two of the embroidery exhibitions I saw in England....but I'm still working with my images and mulling over my observations....trying to put into words an otherwise visual experience. Also while in England, I made more grave rubbings. These (further below) were created in the Warstone Lane Cemetery in the Jewelry Quarter....an amazing place started in 1847 that is no longer available for burials...lots of character! I nearly froze to death while making them....but it was worth it!